TORONTO, Sept. 19, 2018 (GLOBE NEWSWIRE) -- Euro Sun Mining Inc. (TSX: ESM) (“Euro Sun” or the “Company”) is pleased to announce the results of the comprehensive metallurgical pilot plant test program conducted by Eriez Manufacturing at their test facility in the United States. Bulk samples consisting of approximately 3,000 kg per sample; representing the main geometallurgical domains from the Colnic pit and the Rovina pit were selected under the guidance of SRK Consulting. Samples were then stage crushed, ground and subjected to column rougher/scavenger flotation. The primary grind for samples Met 42 and Met 44 (Colnic) was 80% passing 75 microns. The primary grind for sample Met 43 (Rovina) was 80% passing 53 microns. 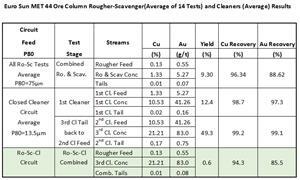 The rougher scavenger concentrate was then re-ground to 80% passing 13.8 microns and cleaned in a column cleaner circuit to produce the final concentrate. The rougher/scavenger concentrate samples for Met 42 and Met 44 were cleaned using a 3-stage closed circuit column arrangement. 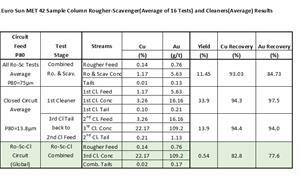 Rougher/scavenger concentrate from sample Met 43 was cleaned using a 2-stage open circuit column arrangement. The results delivered an average gold recovery at the Colnic pit of 81.5% and Copper recoveries of 88.6% while the average gold recovery of the Rovina Pit was 73.2% and Copper recoveries averaged 94.7%, all utilizing no cyanide anywhere in the flotation circuit. Euro Sun confirms that the Ministry of Finance has executed the Fundamental Note on the Mining License ratification for the Rovina Valley Project leaving only the Ministry of Justice to complete the file prior to presentation in the Government meeting for execution by the Prime Minister. The National Agency for Mineral Resources continues to assist the Ministry of Justice to ensure completeness of the file and adherence to the legislation for final approval. Mr. Joe Milbourne, a Qualified Person as defined under National Instrument 43-101 guidelines, has reviewed the scientific and technical information contained in this press release. For further information about Euro Sun Mining, or the contents of this press release, please contact Investor Relations at info@eurosunmining.com. This press release may contain "forward-looking information" within the meaning of applicable Canadian securities legislation. Forward-looking information includes, without limitation, statements regarding the comprehensive metallurgical test results; sample returns and the progress of the ratification of the mining license. Forward-looking information is subject to known and unknown risks, uncertainties and other factors that may cause the actual results, level of activity, performance or achievements of the Company to be materially different from those expressed or implied by such forward-looking information, including risks inherent in the mining industry and risks described in the public disclosure of the Company which is available under the profile of the Company on SEDAR at www.sedar.com and on the Company's website at www.eurosunmining.com. Although the Company has attempted to identify important factors that could cause actual results to differ materially from those contained in forward-looking information, there may be other factors that cause results not to be as anticipated, estimated or intended. There can be no assurance that such information will prove to be accurate, as actual results and future events could differ materially from those anticipated in such statements. Accordingly, readers should not place undue reliance on forward-looking information. The Company does not undertake to update any forward-looking information, except in accordance with applicable securities laws.